1. In Oriental art… a schematized representation of the cosmos, chiefly characterized by a concentric configuration of geometric shapes, each of which contains an image of a deity or an attribute of a deity. 2. 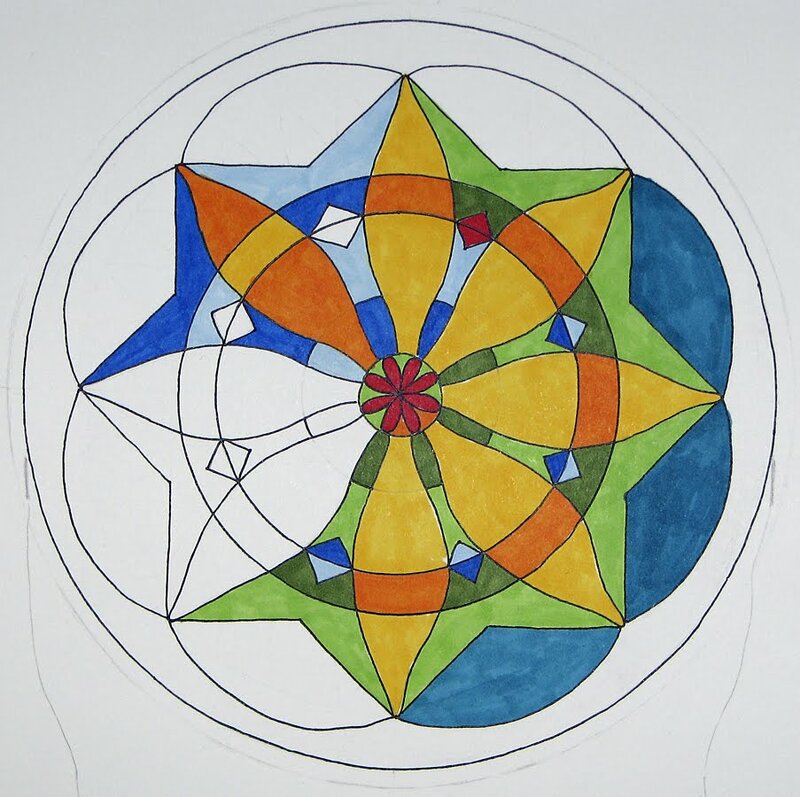 In Jungian psychology… a symbol representing the effort to reunify the self. The Arms & Legs Auction is an engaging event in which one-of-a-kind works of art are donated by local artists to be sold at auction. The objects are mainly tables and chairs – hence the event title. A few years ago I painted and découpaged a little sewing table and donated it to the auction. 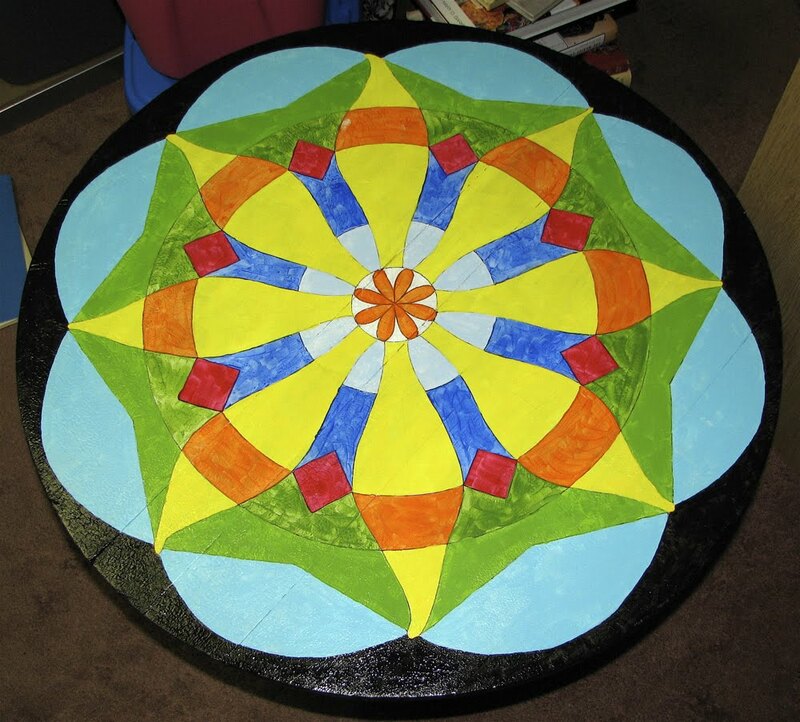 More recently I found the perfect folding, round-topped table to paint for the benefit. After putting the word out that I was looking for a small piece of furniture I was invited to look through the attic of my lovely friend Sadie. 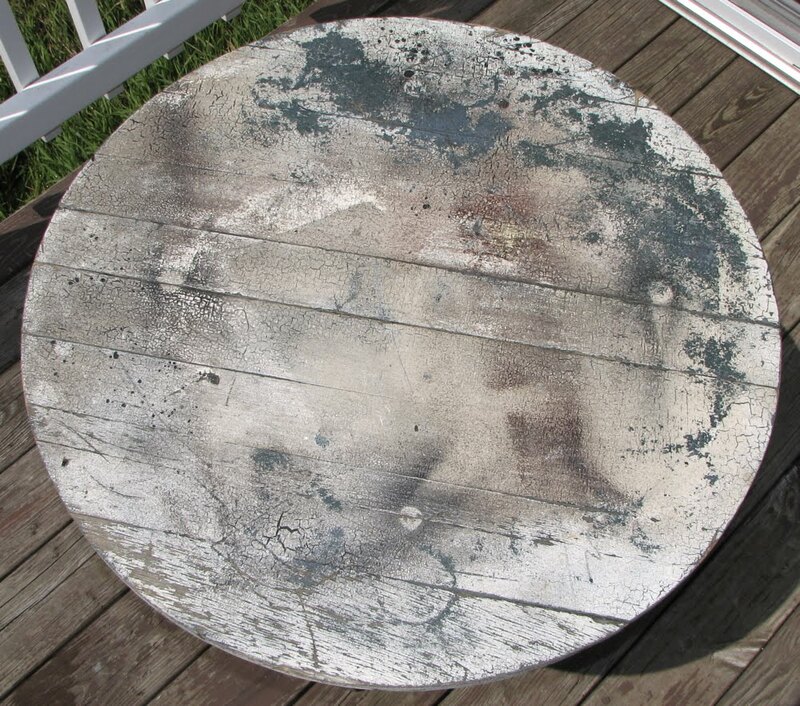 The first table she showed me was in the garage and had obviously been used for many years as the surface on which to place other things while you painted them… It looked rather forlorn, and was folded and tucked in next to the freezer. Hmmm – maybe. I brought this ridden-hard-and-put-away-wet aged beauty home and cleaned the cobwebs off. After evicting the spiders I sanded every surface and began thinking about the transformation. Aahhh… a conversation begins. Along with the details of the folding mechanism and the many colors of paint remnants, I really loved the crazing on the surface of the table. I imagined all the other objects that had been painted while sitting on this table, and about the life it had led until then! 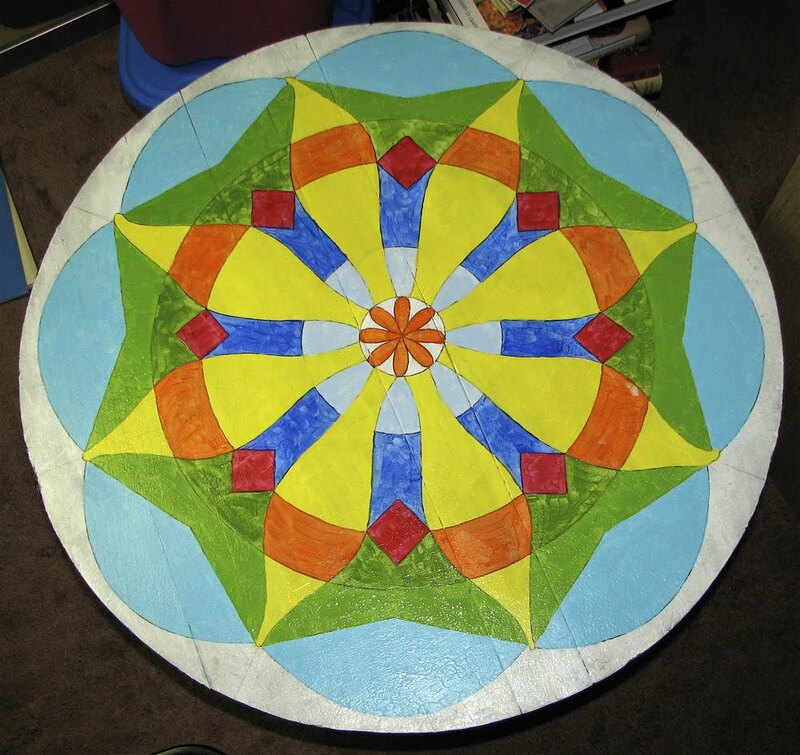 While sanding the top, I almost hated to see the shadows of other paint sessions disappear, but I had bigger plans for this circle. 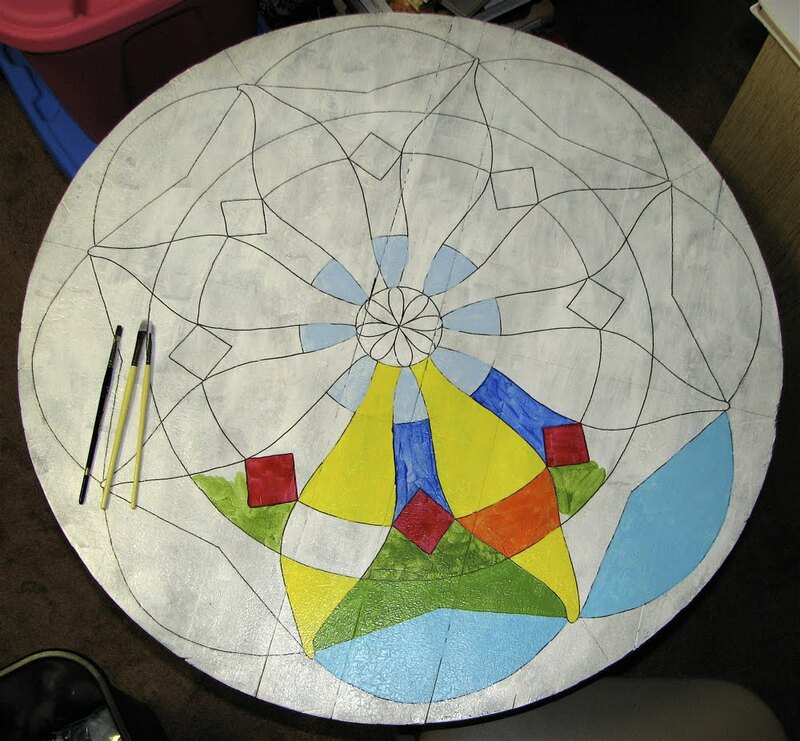 After preparing the table I headed inside for the evening to begin a drawing of the design. After drawing what I had in mind and outlining the design with black pen, I experimented with adding color – hence the varied color combinations in the paper drawing above. 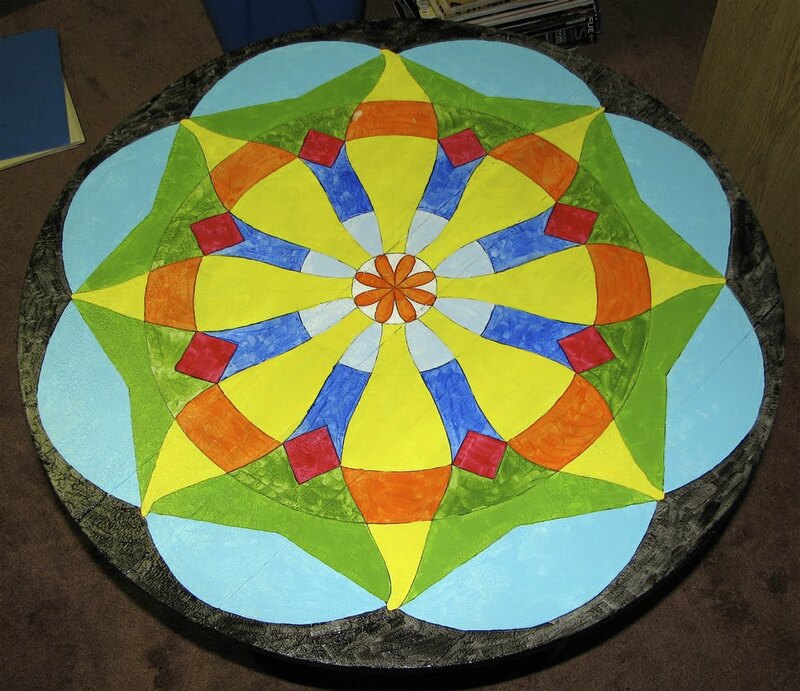 Once the drawing was complete and I had decided on the colors, I began painting the table. The first step was to paint the legs with black acrylic. After coating the outside three surfaces of each leg I decided to keep the interior leg surfaces as they were, showing old layers of black and white paint along with some interesting crazing and finish variations. It was the “distressed look” in its most honest form! 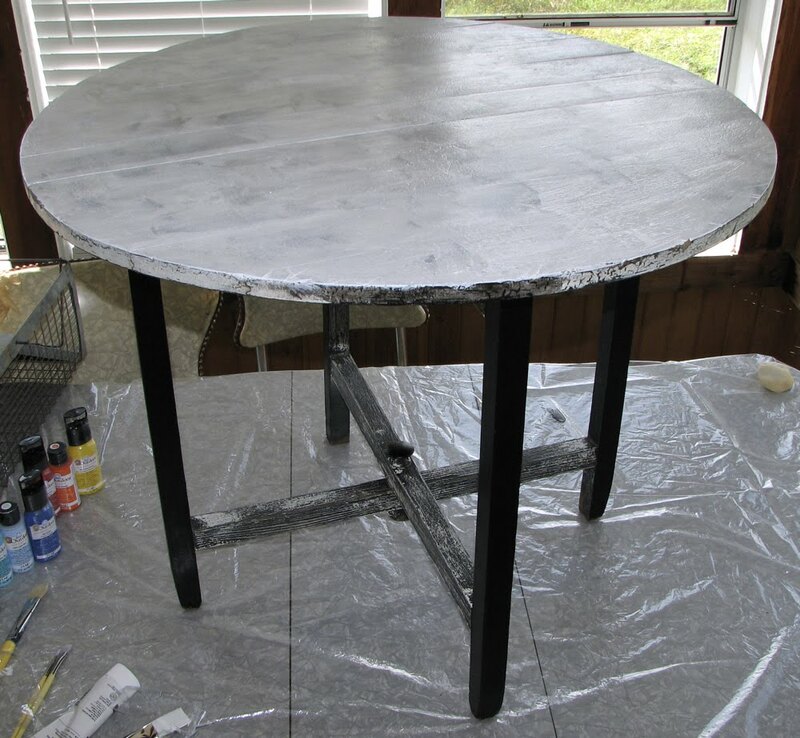 I had sanded them along with all of the table surfaces, and they looked lovely. After preparing the legs I primed the top, then began to duplicate my paper design. 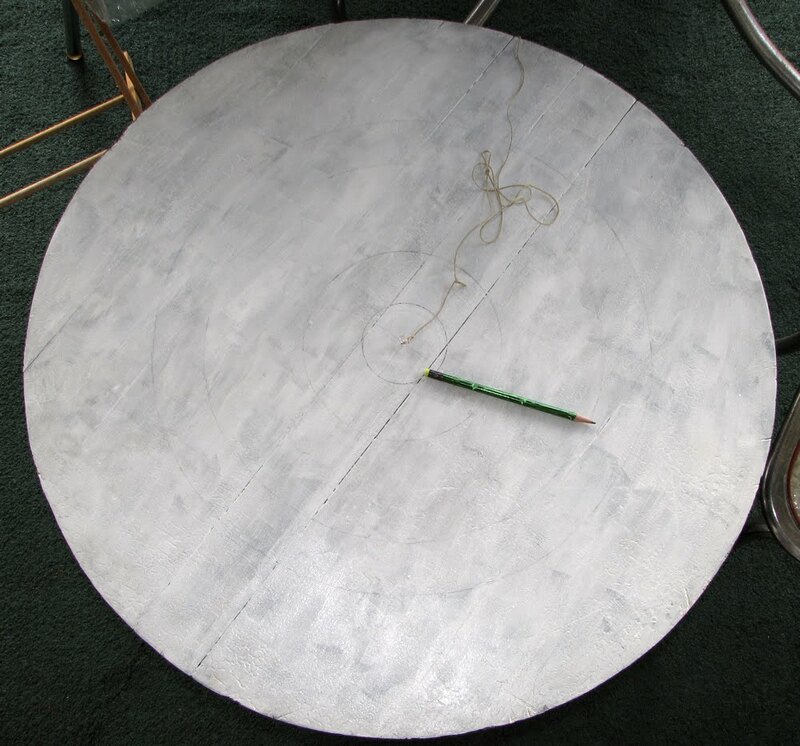 In order to create a mandala on the table, I made the largest compass I ever have by sinking a pin into the very center of the top and tying a string and pencil to it! 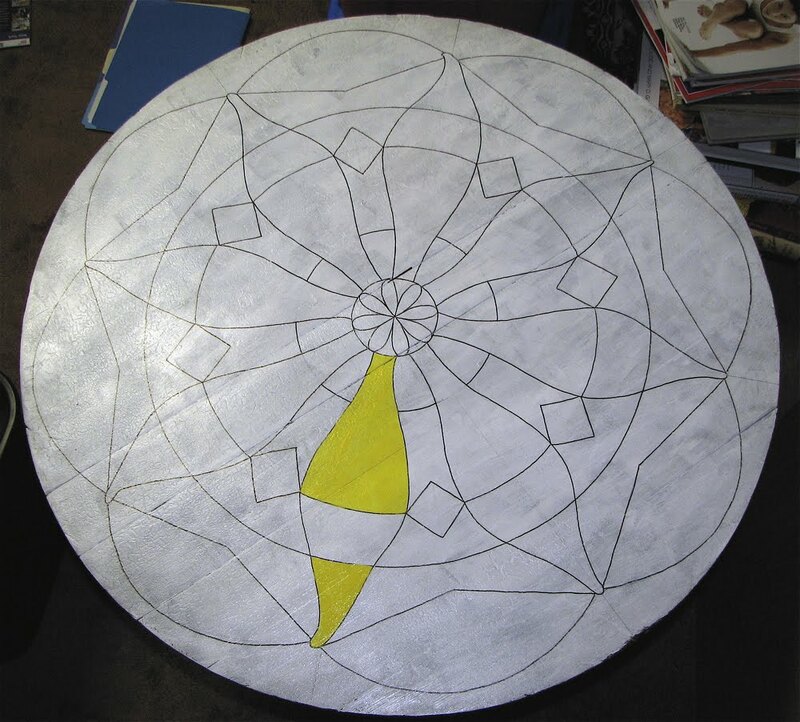 I started by drawing a few circles and then moved on to measuring out the segments of the top. Eventually I transferred my entire drawing to the table, but on a much larger scale than the original. Once I had the drawing the way I wanted it I applied black pen to the lines. Excess pencil lines and marks were then erased and my painting began. The colors were all added straight out of their bottles, in what I would call another primer coat. For later coats of paint I will be mixing the colors to create the color-palette I’ve imagined… for this first layer, however, the primary colors will form a strong base. As I added each color to the surface my “sketch” gradually took shape on the tabletop. A few of the colors were close to what I pre-visualized, but most of them would require mixing for the final coats. Black paint was added to the edges and finally the white was gone… none of the first coats completely covered the white paint as much as I would like, thus they’ll all need to have second and third coats added to give the colors the impact I want. A second application of black was applied to the outside border… and more will be needed. 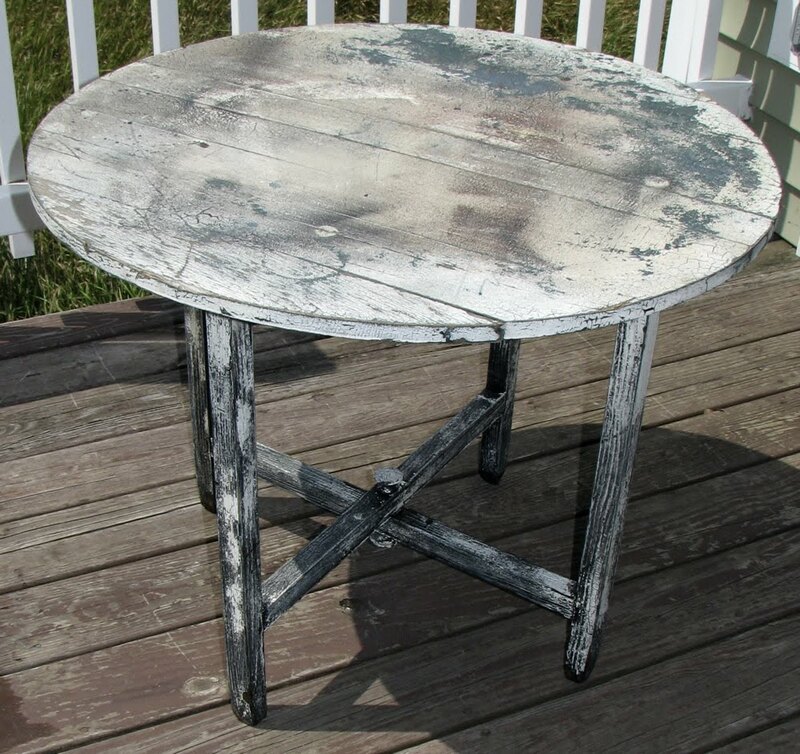 The next step was to begin mixing the colors… The crazing of the old layers of paint can still be seen, adding character and interest to the top and legs of this old workhorse. The next steps are coming in another edition… stay tuned! What a wonderful new life for that table! i loved that you acknowledged its old life as you refinished it! Very nice post. I look forward to seeing the final product. thank you! if you check out the post “In Raptures…” you can check out the final product!